Just as the tree can be traced from its smallest branches to its root, just so all this Indian trouble can be traced through all its phases to its true cause, starvation, abject misery, and despair, the cause of which is the outrageous conduct of the Indian Department for many years, culminating in the later blunders and cruelties of the present Commissioner Morgan. Writing to the Secretary of War from his office in New York City on Monday, 24 November 1890, James R. O’Beirne, the Superintendent of Immigration in that city, sent a letter recommending the services of Father Francis Craft. O’Beirne had served as a Brigadier General and was a recipient of the Medal of Honor for actions during the Civil War. He was well connected politically and familiar with the Honorable Redfield Proctor when the Secretary of War had served as the Governor of Vermont. I herewith take the liberty of enclosing to you a letter received by me from Rev. Francis M. J. Craft, a Catholic Missionary well-known to me, who has had very widespread experience among the Indians, and speaks the Dakota Sioux language perfectly. Better than this, he understands the disposition and temperament of the Indians and their ways of doing things. Rev. Father Craft in his ten years of missionary service among the Indians at Standing Rock, Rosebud and Pine Ridge Agencies, has learned their character fully. His amiable disposition and the well-known salutary influence of his profession would do much to quiet the Indians, and as an interpreter enable the military representatives of the Government to be fully and accurately informed as to what is passing among the Indians at this critical period. I would like to see him sent by the Department to confer with Gen’l Miles on the situation. If he could be sent from him quasi-officially, and on a confidential mission, under the secret service of the War Department, I respectfully suggest, from my experience in the past, very good results might be achieved, and a good plan worked out to let the Indians know what to expect, and to ascertain exactly what they intended doing. There is so much malign squaw-man and half-breed influence at work in the interests of designing white men that it ought to be quietly checkmated, and can only be so done by some such appliance of outside influence as the employment of Father Craft. He is an American, one of the Sons of the Revolution, a convert to the Catholic religion, most highly connected socially, of one of our best families, and of rare patience, good judgment, and fearlessness, combined with a penetrating and studious way of handling those with whom he has to deal and advise. Please think this over carefully and see if it is not a good suggestion of a way to do much good in the treatment of the Indian question by the Army. If you approve of my suggestion, please let me know. Father Craft wrote a letter to the Freeman’s Journal on 20 December 1890, detailing his thoughts on the cause of all the Indian troubles. I know what I say, for I have shared their sufferings for many years. In their despair, Gen. Crook brought them hope. Their confidence in him led them to expect that he would be able to realize their hopes. His death was their death blow, and they felt it. Indians are not fools, but men of keen intellect. Reductions in rations increased these fears. Even Indian agents protested against such cruelty. Mr. Lee, who took the census, made grave mistakes, counted less than the real numbers, and made false reports of prosperity that did not exist. It is not to be wondered they believed in a Messiah, whom they at first doubted and listened to every deceiver who promised hope. Interested whites took advantage of this state of affairs and howled for troops. The army indignantly protested against their false statements, but had to go to the scene of the supposed danger. Interested whites persuaded them that entire destruction was aimed at, and the Indians ran away in fear and despair. Father Jutz calmed them and I brought them back to the agency and the kindness of Gen. Brooke convinced them of their safety. The general’s plan to send Indians after those still out was good and would succeed if the general were left alone. Just as the tree can be traced from its smallest branches to its root, just so all this Indian trouble can be traced through all its phases to its true cause, starvation, abject misery, and despair, the cause of which is the outrageous conduct of the Indian Department for many years, culminating in the later blunders and cruelties of the present Commissioner Morgan. You can see now how the prophesies of the Freeman’s Journal have been verified. If the army had charge this never could have happened, and if it could be kept now in charge, the Indians will have some hope of life and civilization. Writing a letter to friends in New York that was later published in papers across the country, Father Craft assured all that he was recovering from his wounds. He also determined to exonerate what he felt were unjustified attacks on the troops at Wounded Knee. My wound feels considerably better, and I may recover. Am very hopeful. I authorize you to contradict for me in my name, through the press, the reports in circulation that blame the army for the sad tragedy at Wounded Knee creek. Those reports do grave injustice to our soldiers, and are instigated by those averse to an honorable settlement to the present trouble, and hostile to the decree of every true friend of the Indian, that they be permanently transferred from the charge of the Indian bureau to the war department. It is only by such a transfer that the Indians can expect just treatment. The whole trouble originated through interested whites, who had gone about most industriously and misrepresented the army and its movements upon all the agencies. The Indians, were in consequence alarmed and suspicious. They had been led to believe that the true aim of the military was their extermination. The troops acted with greatest kindness and prudence. In the Wounded Knee fight the Indians fired first. The troops fired only when compelled to. I was between both, saw all, and know from an absolute knowledge of the whole affair whereof I say. The Indians state the case just [as] I do. I have every proof at hand, and when able will forward full statement and documentary evidence. Because of his injuries, Father Craft likely was not called to testify in person at the board of inquiry investigating the Wounded Knee battle. His testimony likely came in the form of a deposition with his own map attached. I am a missionary priest of the Catholic church, and have worked in that capacity among the Indians of the northwest for the past ten years. I came to Pine Ridge Agency in December, 1890, to visit the Catholic missions and schools as a representative of the Bureau of Catholic Indian Missions, and also to render what service I could in the settlement of the Indian troubles. On Sunday, December 28th, I learned that Big Foot’s band of Indians had been taken and were in camp near Wounded Knee Creek and that Indians from Standing Rock Agency, whom I knew well, were with them. By permission of General Brooke I went out to see if I could be of any service, as malicious whites on and near all agencies, during the present excitement have, by misrepresenting the intentions of the Army, caused such a state of alarm and suspicion among the Indians as to make it possible for the least excitement or misunderstanding to [precipitate] serious trouble. I hoped to be of some service by going among the Indians and reassuring them. I reached the military camp at Wounded Knee about 11 P.M. In the morning, while the troops were preparing to disarm the Indians, I learned from several Indians with whom I spoke that they had left their agency, alarmed by the reports of the Indians who escaped from Standing Rock after the death of Sitting Bull. The Standing Rock Indians were not with them, but, as they said, left them on the way down, and went toward the Missouri. I saw that the Indians with whom I was speaking were the worst element of their agency, whose camp had for years been the rendezvous of all the worst characters on the Sioux Reservation. About 8:30 A.M. General Forsyth called all the Indian men from the Indian camp to the point marked on the accompanying map, P, in order to separate them from the women and children. This seemed to be a very necessary precaution, although no trouble was apprehended. General Forsyth then spoke to the men through an interpreter, kindly and pleasantly, and explained the necessity of taking the arms, and assured them that they were perfectly safe in the hands of their old friends, the soldiers, and that starvation and other troubles were now happily at an end. The Indians answered in a way that showed they were pleased. Big Foot and others, however, denied having any guns, saying they had all been burned up. General Forsyth reminded them, however, that the day before every man was seen to have at least one gun. General Forsyth then began sending the Indians in, a few at a time, to the camp to get their guns. They returned saying they had none. General Forsyth then pointed out to the Indians how plain it was they were deceiving him, and begged them not to compel him to search for the guns, but to have confidence in him and bring them themselves. A medicine man now began praying, singing and walking around the circle of Indians, his words indicating that the Indians were afraid of what might happen to them when their guns would be taken, and going through various ceremonies that the soldiers’ bullets might not hurt them. General Forsyth told him he had nothing to fear, and he was induced to sit down and be quiet. As the Indians did not care to produce their guns, soldiers were sent to search for them in the Indian camp, but returned with very few. At this moment a soldier saw guns under the Indians’ blankets, and informed General Forsyth and Major Whitside. As quietly as possible they directed the Indians to come forward, one by one, from the location marked on the map “P,” to those marked “S” and “R,” and throw aside their blankets and lay down their arms if they had any. Colonel Forsyth spoke very kindly to them, and said he did not wish himself to take their arms, but would rather they would come forward themselves like men and lay them down. The Indians began to come forward as directed, one by one, to lay down their arms. Fifteen or twenty guns had been thus collected, when I heard among the soldiers in the positions marked “O” & “U,” some one cry out “Look out, look at that,” and saw them attempting to fall back to the square surrounding the Indians. I looked toward the Indians in the position marked “P,” and saw that some were taking their guns from under their blankets and others were raising them ready to fire. The Indians seemed agitated, and from my knowledge of their habits, and especially of the character of this particular band, probably affected by the misrepresentations of malicious whites, I am convinced that the movement came from their fear of what might happen when the guns would be all surrendered, as they saw them being given up one by one. I went up to them and tried to reassure them, but very few listened to me. It is possible that nothing might have occurred had not one young man, said to be the son of Big Foot, suddenly fired. His shot was followed by many others from the Indians. The soldiers did not fire until they were actually compelled to, and after the Indians had fired many shots. When the soldiers returned the fire, the Indians broke up into small parties and charged back and forth across the square, firing and trying to break through. Some broke through towards the southwest, and some, I believe, towards the southeast. As they passed the end of the camp, a few women and children ran out and joined them. The Hotchkiss battery opened on them as they crossed the agency road. It is possible that by this fire some women and children were killed. If so, the killing was unavoidable, as the soldiers could hardly have distinguished them from the men among whom they were, who were firing backwards as they ran. Many concealed themselves in the ravine. This ended the main battle, which lasted from one half to three-quarters of an hour. After all was over at least two shots were fired from the Indian camp “C,” but the soldiers did not reply to them. I was wounded early in the fight, but kept up until everything was over, and attended to the dying. After I finally gave out I was carried to the field hospital “J.” I heard a volley of rifle shots fired from the Indian camp “C.” No shots were fired by the soldiers for some minutes, but I heard some one shouting in “Dakota” as if an interpreter was speaking. The rifle shots from the camp continued and the Hotchkiss battery shelled the camp, and also the tents at “K” and “M,” from which Indians were firing upon the soldiers. I afterwards learned that contrary to their usual custom of protecting their women and children from danger, and of respecting the white flag, which they had hoisted over their camp, these Indians had actually managed to get back to their camp and fired from it upon the soldiers. If women and children were killed in the shelling of this camp, the Indians who caused it are to blame. I have heard this act of these Indians severely condemned by Brules and Ogalalas [sic], who denounced them as murderers of the women and children, and exonerated the soldiers. A few days later Father Craft wrote to his good friend, General O’Beirne, in New York, and indicated that his recovery now looked certain. He took the opportunity to laud the decision to place the Pine Ridge Agency under control of an Army officer and lambasted the decision to not do the same with all the Indian Agencies. General O’Beirne ensured the Indian missionary’s letter was published in the eastern press. I think I am entirely out of danger now. As soon as I am able to write a long letter I will send you a full account of the battle, with a map, and a full account of the Indian situation. I will begin it to-day and finish it as soon as I am able. For the present there is something I wish you would see carried, with all the force possible. It is this: This agency (Pine Ridge) now has a military agent, and has been entirely transferred to the War Department. This is as it should be. Had it been done in time enough, before the battle of Wounded Knee, to silence the malicious whites, who were opposing the plans of the army and misrepresenting its intentions, and also in time to enable the officers to mature their plans and carry them out unopposed, there would have been no battle, as you will see when I send you the full account. Now that the transfer has been made, the Indians are all safely in and the trouble practically over, and the good results of the transfer are evident on all sides. But this is not the case on the other Sioux agencies, the Rosebud, Crow Creek, Cheyenne River, and Standing Rock. In the case of those agencies there has been a disgraceful compromise. A military agent has, it is true, a supervision over each of those agencies, but the civil agent has been allowed to remain. This is very wrong and entirely unnecessary. The only excuse offered is that the Indian Ring cannot afford to lose the plunder it has held so long, and for which it has caused misery, starvation, and bloodshed. Nothing less than an entire transfer of all Sioux agencies to the War Department will be of any use. The compromise is disgraceful, unnecessary, useless, and a ‘dead give away’ of the motives of the Indian Department. Please protest strongly and unceasingly through the press, and by every other effective means, against the compromise, and demand that the transfer be entire and immediate. Use my name in the matter just as you please. I will write again very soon. Yours Sincerely, F. M. J. Craft. A detailed, if not fantastical, account of Father Craft’s wounding at the Battle of Wounded Knee appeared in newspapers across the country in February 1891. That same month Father Craft wrote another letter that appeared in part in The Sun in which he identifies the name of the Lakota that stabbed him, declares that he desired to be buried with the Indians at Wounded Knee, and corrects inaccuracies that had been published in an obituary when he was thought to have died after the battle. “I see by the Washington papers that Morgan’s friends hint at my removal from the reservation. Let them try it. An American knows Americans well enough to be sure that they will not permit such villainy. I intend to fight it in the press and in the courts, and if I am still further disabled by illness I will have the fight carried on by others. The only thing that stands in the way of a speedy and permanent settlement of all difficulties by an immediate transfer of the Indians to the war department is the desire of the politicians to retain plunders. The army would maintain peace by justice to the Indian because its spirit is honorable and because its interests are for peace; but if the American people prefer to keep the politicians in charge, they must expect the usual results. I am heartily sick and tired of witnessing miseries that I cannot correct and sharing the sufferings of the unfortunate Indians and brave soldiers who are forced into conflict and then slandered by the cowardly politicians who slaughtered them. Everything looks quiet just now, but so long as interested parties have a chance to stir up trouble and the Indians are foolish enough to believe them, it feels as if we were sitting on a powder keg with dangerous sparks unpleasantly near. We have a military agent here. Everything may be safe, but I know the situation too well to feel quite sure of anything unless the war department can have complete control of all the agencies. It is the only sure remedy for all the Indian troubles and the only hope for the Indians. The Sioux delegation, while at Washington, was thoroughly manipulated by the Indian bureau. Some of the Indians were made to say what they know to be false about the army, and others claim they were silenced when they wanted to give facts. Many things were published which they never thought of saying. Captain Lee called up Hollow Horn Bear, one of the delegates from Rosebud. The Indian denies all the statements attributed to him and said he never spoke against the army. The Indians who returned from Washington say they went there to ask for military agents, but were badly treated by the Indian bureau and were prevented from saying what they wished to say. I got my share of abuse too. The Indian bureau begins now to realize that in blaming the army they have walked into the largest and liveliest hornet’s nest in the country. I am entirely well now and will soon leave to finish my work at the mission. Thomas W. Foley, Father Francis M. Craft: Missionary to the Sioux (Lincoln: University of Nebraska Press, 2002), 84. James R. O’Beirne, Reports and Correspondence related to the Army Investigation of the Battle of Wounded Knee, 208. Hereafter cited as RCAIBWK. Francis M. Craft, Saint Paul Daily Globe, vol. 13, no. 3, 1. Craft, in At Standing Rock and Wounded Knee: The Journals and Papers of Father Francis M. Craft, 1888-1890 by Thomas W. Foley (Norman, Oklahoma: The Arthur H. Clark Company, 2009), 293. St. Paul Daily Globe, vol. 12, no. 364 (St. Paul, Minn.), 1. St. Paul Daily Globe, vol. 13, no. 1 (St. Paul, Minn.), 1. St. Paul Daily Globe, vol. 13, no. 2 (St. Paul, Minn.), 1. Craft, St. Paul Daily Globe, vol. 13, no. 15 (St. Paul, Minn.), 4. Craft, The Sun, vol. 58, no. 140, (New York, N.Y.), 7. Craft, Evening Star, vol. 78, no. 18,054 (Washington, D.C.), 7. The Lafayette Advertiser, vol. 26, no. 24 (Lafayette, La. ), 1. The Sun, vol. 18, no. 170 (New York, N.Y.), 7. The Wichita Daily Eagle, vol. 14, no. 121 (Whichta, Kan., 7 Apr 1891), 4. 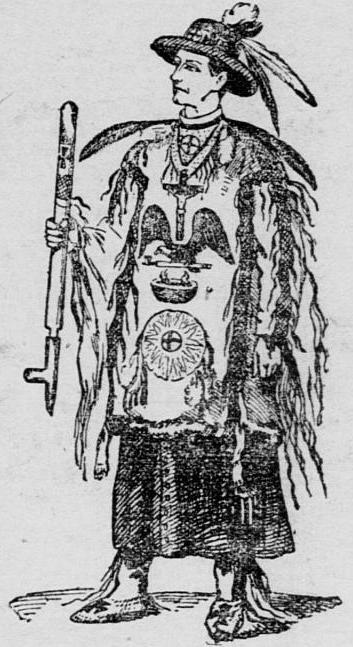 Omaha Daily Bee, vol. 20, no. 302 (Omaha, Neb., 21 Apr 1891), 1. Samuel L. Russell, “Father Francis M. J. 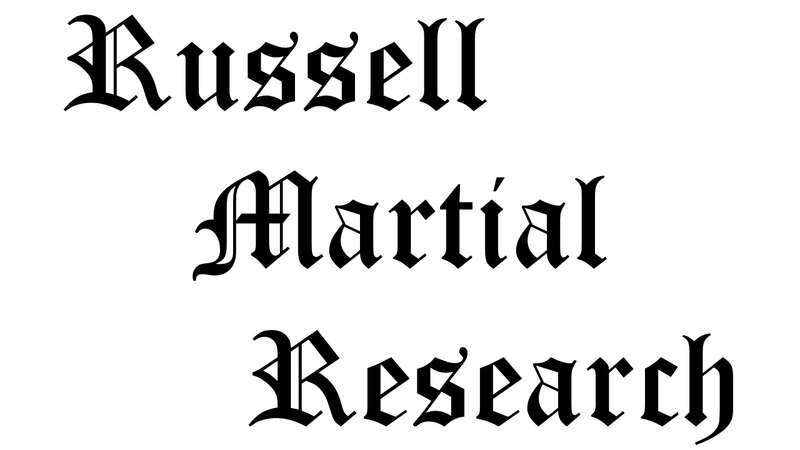 Craft – Missionary Wounded in Battle,” Army at Wounded Knee (Sumter, SC: Russell Martial Research, 2013-2014, http://wp.me/p3NoJy-rC), posted 14 Feb 2014, accessed __________. This entry was posted in Casualties, Newspaper Articles, Wounded Knee Investigation and tagged 1890, 7th Cavalry, 7th Cavalry Regiment (United States), Big Foot, Brule, Father Francis Craft, Lakota, Military Investigation, Miniconjou, Oglala Lakota, Pine Ridge, Pine Ridge Agency, Pine Ridge Indian Reservation, Wounded Knee, Wounded Knee Creek, Wounded Knee Massacre. Bookmark the permalink. Thank you for sharing this moving historical narrative! 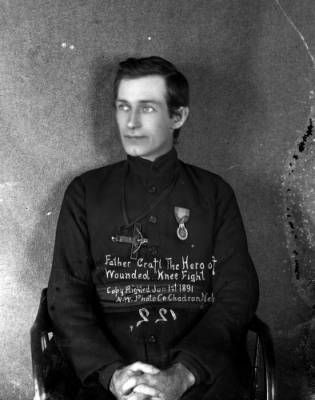 Father Craft was a very interesting witness, in that he was unfamiliar with the Soldiers at Wounded Knee, albeit he was a strong advocate of the Army. Many contemporary historians write off all of the testimony that 7th Cav. and 1st Art. officers provided with the guise that they were lying to cover up their dastardly deeds and protect their inept commander. I find this astounding, as the documentation for Wounded Knee is substantial, taken under oath, provided within days of the battle, but largely ignored by present historians. However, Craft, who was not afraid to rattle cages and very vocal on what he believed to be the truth, provided a deposition that corroborated the soldiers’ accounts of Wounded Knee. Moreover, he was recovering in the Catholic Church, not the army field hospital, so was not privy to the post-battle banter and collaboration, so to speak, that occurred among the soldiers prior to giving testimony. He provided a similar account to Eli Ricker, but the judge seemed to not pay much heed to Craft’s version of events. Craft gave an even lengthier description of Wounded Knee in Feb. 1892 that is recorded in “At Standing Rock and Wounded Knee,” by Thomas Foley, but I haven’t been given permission yet to reproduce it, and haven’t found it recorded anywhere other than in Foley’s book. Foley has produced two good reads on Father Craft. A Quote from Foley in his closing paragraphs I think is on the mark, “Proponents who would enshrine Wounded Knee as the iconic epitome of Native American victimization diminish the heroic stand taken by Big Foot’s warriors.” (Foley, 318) Dewey Beard’s account of his exploits at Wounded Knee are singularly impressive and undoubtedly heroic… and account, in part, for why the 7th Cav. continued the battle up the Ravine, to suppress such fierce resistance. The more I read on Wounded Knee, the more I believe that all of the sins of 300+ years of failed Euro-American policy in confronting Native Americans are heaped, by contemporary historians, on the Soldiers at Wounded Knee. The 7th Cavalry became the Indian Bureau’s scapegoat–for all of its own failed policies and corrupt practices–within days of the battle. They are a convenient scapegoat for historians to dump on as well. Source: Craft, At Standing Rock and Wounded Knee, by Thomas W. Foley, 35. Father Craft was an energetic and visionary man, whose efforts were thwarted at every turn, even by his own Church. He was too vocal, rattled too many cages, and created some very powerful and politically connected enemies along the way. Perhaps his efforts would have blossomed if he had allied himself with St. Katherine Drexel. Ultimately, his twenty years of work among the Lakota bore little fruit, and he settled into a small parish in Pennsylvania. I think Fr. Craft nailed the root cause of the problem. The “Ghost Dance” or “Messiah Craze” or “Wovoka” religion was merely a symptom, and not the first time in Native American culture that such a concept arose during times of “abject poverty, misery, and starvation.” I would surmise that several Lakota leaders used the guise of the religion as a means to exert greater sway–read power–over their tribal members. Certainly not an alien concept in human history. Generals Brooke and Miles both recognized the Lakota’s desperate straits as the real problem. The few experienced Indian Agents, McLaughlin and Cooper, didn’t see the Ghost Dance as an issue, but at least on McLaughlin’s part, saw it as an opportunity to rid his Agency, Standing Rock, of his arch nemesis, Sitting Bull. Gen. Miles also believed, as did many, perhaps most in the U.S. Government, that the potential of an outbreak in the spring was a real likelihood. He indicated that the Indians, despite all their deprivations, were in a stronger position to wage a spring campaign than ever, mainly because there were more domestic cattle in the area than any buffalo herds in the past half century, and because many of the Lakota had sold most all their possessions for arms and ammunition–Winchester repeating rifles as opposed to the single shot Springfield carbines that the Army still carried. Miles’ greatest concern was the leaders that were using the new religion as a means of holding sway over their tribes. The Lakota by 1890 were greatly split between progressives (cooperated with the Indian Agents) and the non-progressives (wanted a return to the old way of life). Again not a new concept in human history–read traditionalists versus reformers, or liberals versus conservatives, or Democrats versus Republicans. The Ghost Dance enabled the non-progressive leaders like Kicking Bear and Two Strike–and Big Foot as well according to Government reports–to unify the progressive Indians with the non-progressives, increasing the threat of a Spring outbreak. Father Craft’s empathy lay entirely with the Lakota, to the point of directing that his body be buried with the Indians in the trench at Wounded Knee if he died of his wounds. He was at Wounded Knee to serve as an interpreter, as a friendly face known to the Lakota through his last ten years of missionary work, and to convince the warriors that they would be well cared for if only they peacefully surrendered their weapons. He was positioned between the warriors and the cavalry at the opening volley. He was, according one of his later accounts, shot by soldiers and stabbed by a Brule. He vociferously blamed the Indian Bureau for all the ills the Lakota suffered, and saw those ills–abject poverty, misery, and starvation–as the root cause of all the turbulence in Nov. and Dec. 1890. Yet from his perspective on the battlefield, he faulted the Lakota for initiating the hostilities, for continuing the resistance, and indiscriminately firing on their own village directly behind a troop of cavalry, and lauded the actions of the cavalry in trying to spare the lives of women and children to the point of taking greater casualties themselves than if they had just wantonly and mercilessly shot all of them down.